Very nice - but I have one tip for improvement - split the logo on top with different colors where it is cut in half, so that one is blue toned and one is brown like it is now. That would have made it even greater designwise. Gotta love that borderscroll eh? 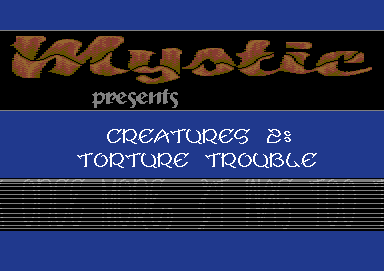 Nice code by Krill / Plush aka Mystic (1997). This style of intro has been used before by Plush, just replacing the logo and a few colours. Typical high quality by Plush - I like. Piece of coding for me.